"Consent is not the absence of 'NO', it is an enthusiastic YES " While seemingly straightforward, Tia and Bryony hadn't considered this subject too seriously until it comes up in conversation with their friends and they realise just how important it is. Following the sexual assault of a classmate, a group of teenage girls find themselves discussing the term consent, what it actually means for them in their current relationships, and how they act and make decisions with peer influence. 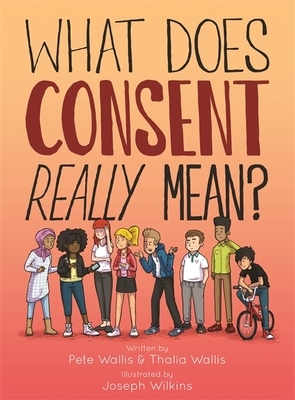 Joined by their male friends who offer another perspective, this rich graphic novel uncovers the need for more informed conversations with young people around consent and healthy relationships. Accompanying the graphics are sexual health resources for students and teachers, which make this a perfect tool for broaching the subject with teens. Pete Wallis is the Senior Practitioner in Restorative Justice for Oxfordshire Youth Justice Service UK and a founding member of the charity SAFE! Support for young people affected by crime. Joseph Wilkins is a freelance illustrator and designer based in Oxford. He graduated from Falmouth College of Arts in 2006. His website can be found at www.josephwilkins.co.uk. Thalia Wallis is a relational psychotherapist who supports young victims of crime, as well as delivering psycho-educational workshops in schools to increase students' mental well-being and resilience.